Vestas are returning to the Volvo Ocean Race for a second consecutive edition, after launching their 2017-18 campaign in partnership with 11th Hour Racing at simultaneous events in Newport, Rhode Island and Aarhus – where it was also announced that the fleet will make a ‘fly by’ of the Danish city on the final leg. 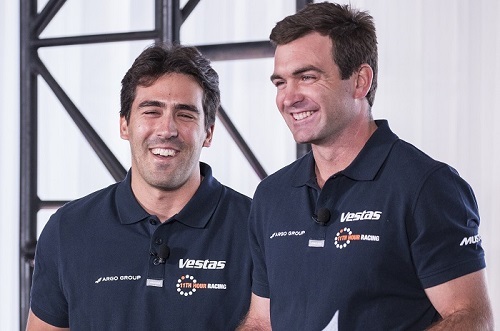 Vestas 11th Hour Racing will be led by the American duo of Charlie Enright and Mark Towill. The team is the fourth to announce for the upcoming edition, which starts October 22, 2016, and they will use the race to promote a sustainability message around the world. The Vestas 11th Hour Racing campaign is a unique platform for Vestas to promote its vision, which is to be the global leader in sustainable energy solutions. “The Volvo Ocean Race is a proven platform for Vestas and a unique strategic fit to promote our new vision and market-leading energy solutions in our key markets and engage with customers,” said Vestas President and CEO Anders Runevad. It’s also an ideal fit for 11th Hour Racing, a Newport-based program of The Schmidt Family Foundation which establishes strategic partnerships within the sailing and marine communities to promote systemic change for the health of our marine environment. “Our partnership with 11th Hour Racing sends a very strong signal with two leading players within sustainability combining forces to promote sustainable solutions within wind and water,” added Runevad. 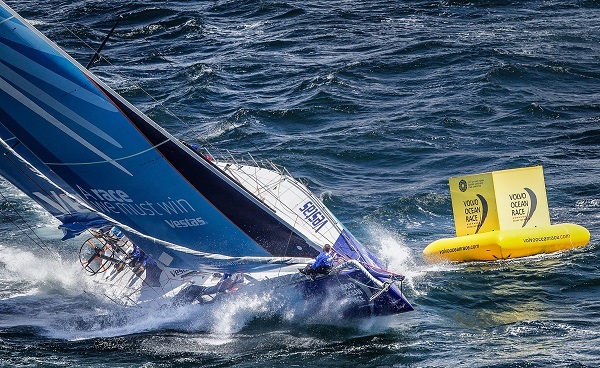 Vestas competed in 2014-15 as Team Vestas Wind – running aground on Leg 2 and rebuilding the boat against all odds to make a landmark return in Lisbon at the start of Leg 8. This is only the second time in VOR history, and the first since 1993-94, that three major team sponsors have returned for a second consecutive race – with Vestas, Dongfeng and MAPFRE all back on the start line. Team AkzoNobel take the total number of confirmed teams to four with seven months still to go to the start of the race. The Volvo Ocean Race also revealed that a mark of the course will ensure the fleet will sail close to Dokk1 in Aarhus on the final leg of the 2017-18 race between Gothenburg and The Hague – giving the people of the city a great view of the competing teams on their One Design Volvo Ocean 65s. Twenty-five Danish sailors have competed in the race to date and two teams have raced under the Danish flag – SAS Baia Viking in 1985-86 and Team Vestas Wind in 2014-15. Vestas 11th Hour Racing will sail under Danish and American flags. The teams will depart Alicante, Spain on October 22 and race 45,000 nautical miles around the world with stops at Lisbon, Cape Town, Melbourne, Hong Kong, Guangzhou, Auckland, Itajaí, Newport, Cardiff and Gothenburg before the finish in The Hague. For more information, visit volvooceanrace.com.